Proposals floated by Republican leaders won't achieve President Trump's campaign promises of more coverage, better benefits, and lower costs, but a single-payer reform would, according to a commentary published today [Tuesday, Feb. 21] in Annals of Internal Medicine, one of the nation's most prestigious and widely cited medical journals. In today's Annals commentary, longtime health policy experts Drs. Steffie Woolhandler and David Himmelstein warn that the proposals by Speaker Paul Ryan, R-Wis., and Secretary of HHS Tom Price would slash Medicaid spending for the poor, shift the ACA's subsidies from the near-poor to wealthier Americans, and replace Medicare with a voucher program, even as they would cut Medicare's funding and raise the program's eligibility age. Woolhandler and Himmelstein review evidence that, in contrast, single-payer reform could provide comprehensive first-dollar coverage to all Americans within the current budgetary envelope because of vast savings on health care bureaucracy and profits. The authors estimate that a streamlined, publicly financed single-payer program would save $504 billion annually on health care paperwork and profits, including $220 billion on insurance overhead, $150 billion in hospital billing and administration and $75 billion doctors' billing and paperwork. They estimate that an additional $113 billion could be saved each year by hard bargaining with drug companies over prices. The data supporting their estimates is summarized in a table. The savings would cover the cost of expanding insurance to the 26 million who remain uninsured despite the ACA, as well as "plugging the gaps in existing coverage -- abolishing copayments and deductibles, covering such services as dental and long-term care that many policies exclude." The lead author of the commentary, Dr. Steffie Woolhandler, is an internist, distinguished professor of public health and health policy at CUNY's Hunter College, and lecturer in medicine at Harvard Medical School. 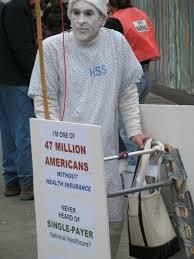 She said: "We're wasting hundreds of billions of health care dollars on insurance paperwork and profits. Private insurers take more than 12 cents of every premium dollar for their overhead and profit, as compared to just over 2 cents in Medicare. Meanwhile, 26 million are still uninsured and millions more with coverage can't afford care. It's time we make our health care system cater to patients instead of bending over backward to help insurance companies." Dr. David Himmelstein, the senior author, is a primary care doctor and, like Woolhander, a distinguished professor at CUNY's Hunter College and lecturer at Harvard Medical School. He noted: "We urgently need reform that moves forward from the ACA, but the Price and Ryan plans would replace Obamacare with something much worse. Polls show that most Americans -- including most people who want the ACA repealed, and even a strong minority of Republicans - want single-payer reform. And doctors are crying out for such reform. The Annals of Internal Medicine is one of the most respected and traditional medical journals. Their willingness to publish a call for single payer signals that it's a mainstream idea in our profession." The Annals of Internal Medicine is the flagship journal of the American College of Physicians (ACP), the nation's largest medical specialty organization with 148,000 internal medicine physicians, related subspecialists, and medical students. In 2007, the Annals published a lengthy policy article in which the ACP said a single-payer system was one pathway to achieving universal coverage. In early 2008, it published a study showing 59 percent of U.S. physicians support "government legislation to establish national health insurance," a leap of 10 percentage points from five years before. The commentary is believed to be the first full-length, direct call for single payer, or national health insurance, that the journal has published in its 90-year history. "Single-Payer Reform: The Only Way to Fulfill the President's Pledge of More Coverage, Better Benefits, and Lower Costs," by Steffie Woolhandler, M.D., M.P.H., and David U. Himmelstein, M.D. Annals of Internal Medicine. Published online first, Feb. 21, 2017. doi:10.7326/M17-0302. Disclosures: Drs. Woolhandler and Himmelstein co-founded Physicians for a National Health Program, a nonprofit educational and research organization that supports a single-payer national health plan; they also served as advisers to Sen. Bernie Sanders' presidential campaign. Neither the Sanders campaign nor PNHP played any role in funding or otherwise supporting the commentary.